I am pretty sure I write the same “I’m-so-sorry-that-it’s-been-so-long-since-I’ve-posted” apology every year. So, wait, maybe that’s just how I roll on this blog now and I should stop apologizing for it and instead accept that this is just real life for me now, huh? Whew! That feels all of a sudden so free and clear and we can start a new year on a good foot. Ready? Here we go! If you’ve been on Twitter lately, you’ve seen many posts and tweets related to people’s #OneWord2017 (it’s likely the reason you clicked on this post in the first place! 🙂 ). As a practice I try to really think through things before I try them out, but then again, I guess I am also “that person” who tries things because I want to see how they’ll work out–especially when it’s related to a blogging/Twitter challenge. It’s different, no? Well, that’s kind of just like me, right? Let me explain what I was thinking when I picked this word. I purposefully chose a word (and picture) that sent me in loads of different directions with its connections and impact and am hoping it can apply to all parts of my life (not just my professional one). …me and my students to get literally outside. I have always thought that being part of nature and playing is important to creativity, health, etc., but haven’t yet fully embraced it and gotten my kids (at home and at school) outside as much as I’d like. Two years ago I made a commitment to extra recess every morning because of that reason, but then for a variety of reasons went backwards on that decision. Here’s to picking it up again. Anyone wanna come play in the woods with us tomorrow? …me and my students to think outside the box. I know it’s a bit cliché, and many even subscribe to the idea of “Don’t think outside the box, think like there is no box!”, but for me this goal can apply to many things. It can be applied to so many different scenarios from reading books we hadn’t ever thought of, trying a new strategy for presenting information, sharing our thinking or even how we structure our day. Because it’s so open-ended, I think it will be easy to find ways to take on the challenge and change my thinking. Who’s up for jumping out of that box with me? …both my students and me to venture outside our bubbles. While this goal sounds a lot like the previous one, my intention is that this applies to the people with which we’ll interact over the next year. I want both myself and my Rm. 202 friends (my colleagues and family members and friends as well) to be challenged to reach out to new people, to seek out different perspectives, to strive to understand others’ cultures and ways of life. I am becoming aware that now, perhaps more than ever, surrounding yourselves with people who look just like you, think just like you and act just like you can be very dangerous. When we are only privy to what we already know and already think, we can quickly begin to see the rest of the world as “other” and then quickly begin to shelter ourselves even more. Unfortunately, we also miss out of great things that the rest of the world has to share with us. We miss out. Diversity makes us all better. …me to get outside the walls of my classroom. Just like when you stay in your “bubble” as a person, being in the “bubble” of your classroom and never venturing out means you’re missing out on the greatness that is blooming in other people and places in your school. Other teachers are doing things in new ways, with new ideas and finding new avenues to inspire students and you (I) owe it to my own students to do whatever I can to plug into it! Maybe it takes away some of my planning time, maybe I’m uncomfortable because I’m introverted, maybe I’m fine with how I’ve always done things (which, by the way, is not my own thinking, but I can see how others function that way), maybe I just don’t want to…but it is my duty to push past all of those “maybes” and try stretch outside myself (and the comfort of my four walls). And who knows? Maybe there’s a new friend, new strategy or new experience waiting for me that I don’t even know about yet. Who wouldn’t want that? Whew! This was a BUSY week! We had a day off with Election Day, but then came back and hit the ground running with Veterans’ Day on Friday and our program. We were really excited about continuing our work with shapes, non-fiction (both in Reading and Writing), as well as some author work with Lauren Castillo as we finished up the Global Read Aloud. So…that meant that we got 19 books read in 4 days, and we also hit a TREMENDOUS milestone: we passed 200 books!! This week we read 3 or 4 non-fiction books to help us with our reading and writing work, 5 shape books to go along with our math investigations, 2 books about the sun (the focus in our Science unit right now), and a couple of additional texts by some authors we love but haven’t read yet: The Happiest Book Ever by Bob Shea (we started Wednesday morning with this one! ), King Baby by Kate Beaton (we read this one twice because it was so good! ), Cat the Cat Who is That? and Nanette’s Baguette by Mo Willems (all those -et words!! ), and Happy Like Soccer by Maribeth Boelts and Lauren Castillo. Lastly, we ended the week with a Veterans’ Day tribute as Mrs. Meihaus read America’s White Table to us during our Library visit. The #classroombookaday hashtag is one I’ve seen before, and have thought about trying out, but most of the time I’ve caught it too late in the game to get started (I’m kind of an all-or-nothing person, so unless it’s the beginning of the year/month/quarter, etc., it’s hard for me to do). This time around I had already been thinking about it before school anyway, and had been informally keeping track of our read alouds as we got into the first days of first grade. Then, my friend Ms. Turken (@im4students@im4students) and our principal, Mrs. Sisul (@GRRprincipal), both got involved and I knew it was on. There are bulletin boards and tons of books being read and lots of fabulous stories being shared and laughs being laughed. I am pretty sure, too, that it’s a friendly challenge, with each of us cheering the other one on, rather than declaring a winner or counting who’s got the most (right, friends??). I’m super excited about how it’s going already, and am interested to see what kinds of conversations come out of this kind of data collection. I can already see TONS of math in the images I have of our door (which is where we’re tracking our books), and there are many discussions about predictions in our future, too. Here’s our #classroombookaday data up to this afternoon; we’ve been reading since August 16, so today was day 11. On Open House night, I had up a wish list that families could grab from and donate items to our class if they liked. One thing on the list was play-doh. I hadn’t ever asked for it before, but got the idea from another teacher, and thought I’d give it a try. Play-Doh is one of those things (kind of like Legos and blocks) that can be used in so many ways. Thanks to the Ella and her family, we got a huge box of Play-Doh a couple of days before school started! THANK YOU, KOHRINGS!! On Thursday is was time to whip it out and discover what we could do with it! Part of a guided discovery is for kiddos to just play and have fun, to figure out what they can and want to do with a certain item/manipulative. So after we went over some basic guidelines (only use the color from your can, keep it on the table, be sure to clean up all the bits and pieces when you’re finished, etc.) Rm. 202 kids got the first 5 or so minutes to do whatever they wanted. Then we spent some time using the Play-Doh to share some of our thinking. Kiddos were asked do create something that represented the following things: 1) their FAVORITE thing to do when they aren’t at school (by the way, lots of Rm. 202 kiddos made TVs), and 2) their FAVORITE thing to do at school. Then I had kiddos make their names. Not a hard thing, really, but some kiddos needed encouragement with figuring out how to use the amount of Play-Doh they had to make the letters they needed or to shape the “curvy” letters so we knew what they said. Some kiddos had time to make both their first and last names, and we even had a couple of Rm. 202 friends share tips for how to make their dough super flat (Allie used her forearm, and Peter used his fist and pushed real hard!). I was excited for how they were excited, as well as for the things we learned about each other during this seemingly “easy” activity. It’s a first time I’ve done an intro survey this way, and am glad that I did. After we had had a chance to investigate and play, then Play-Doh then became a choice during afternoon choice time. I’m excited to see the other ways we’ll use it to represent our learning as we go further into the year, too! Students: What did you make with your Play-Doh to show what you like to do outside of school? What did you find that was easy about this? What was tricky for you? Parents: What did your kiddos tell you about our Play-Doh investigation? Were you surprised with what they made? Teachers: What ways have you used Play-Doh in your classroom with your learners? We’d love to hear from you!! 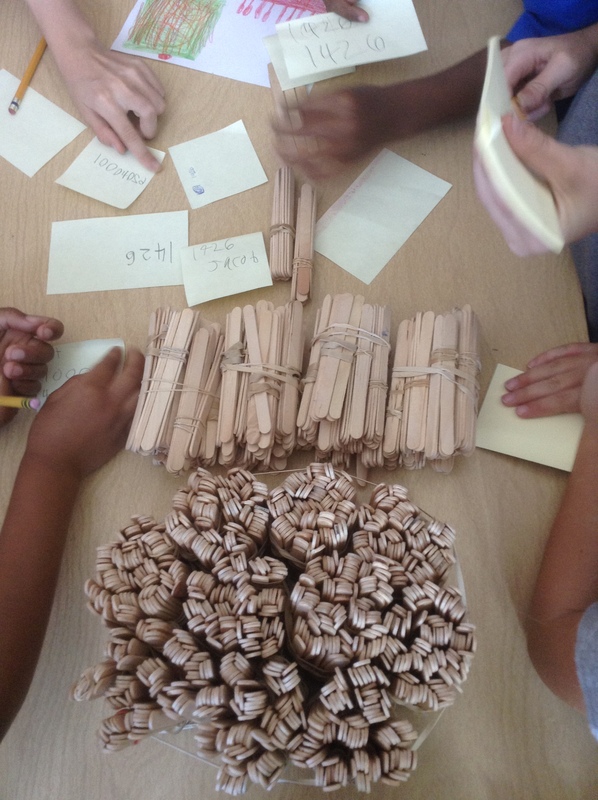 I mentioned on the math warm-ups post that we had been working on place value, and that mathematicians had a challenge to figure out how many sticks were in a big ‘ole pile. They were given a small group (their partner plus another partnership) and two questions: How many sticks do you have? How can you count them in a way that will be easy to show someone else what you’re doing? Each group was given a pile of popsicle sticks and they got busy! A group collected bundles of ten in their box as they went along. As I went around to each group, I asked how they had decided what to do, and how they were determining how many sticks they had. Most were bundling in 10s (yay!) and I nudged them to make an even easier way to see how much is in a big pile. Could they continue to bundle and make a bigger group? In the end, most groups ended up with bundles of 100, some 10s and–if their pile had any–some leftover 1s. They put their collections back in the tubs, and marked how many they had with a post-it note. Then we worked for a bit on how to model the numbers we had made. The next step was to figure out how many we had altogether. Many suggested that we could put our bundles together, but weren’t (at first) sure how to do that. We talked about how they had made their 100s bundles–with 10 10s–and then guessed that we might be able to make some more 100s from the loose 10s in everyone’s tubs. Left with a massive pile of 100s, that eventually led us to thinking there must be a better way to show how much that pile had in it. I asked if they thought we could bundle any bigger numbers and honestly most of them thought I was crazy! I just began collecting 100s in my arms and counting: 100, 200, 300, 400….and they got the idea. They going until they got to…10 100s! That was a great conversation next about what number we had just made. 10 100? 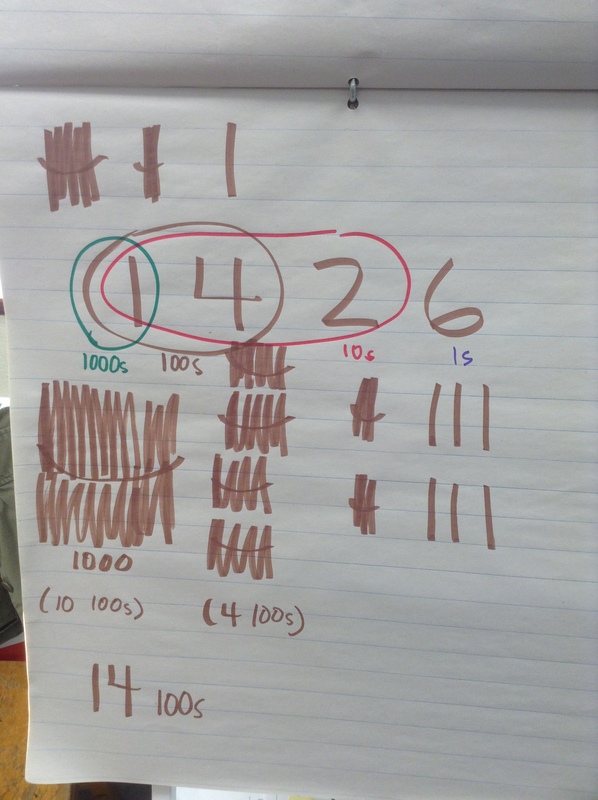 We figured out that it was a 1000, and that when we said “10 100” that helped us know about how many bundles were inside, but that it wasn’t the right way to say the number. We stretched a big ‘ole rubber band and made a 1000 bundle!! 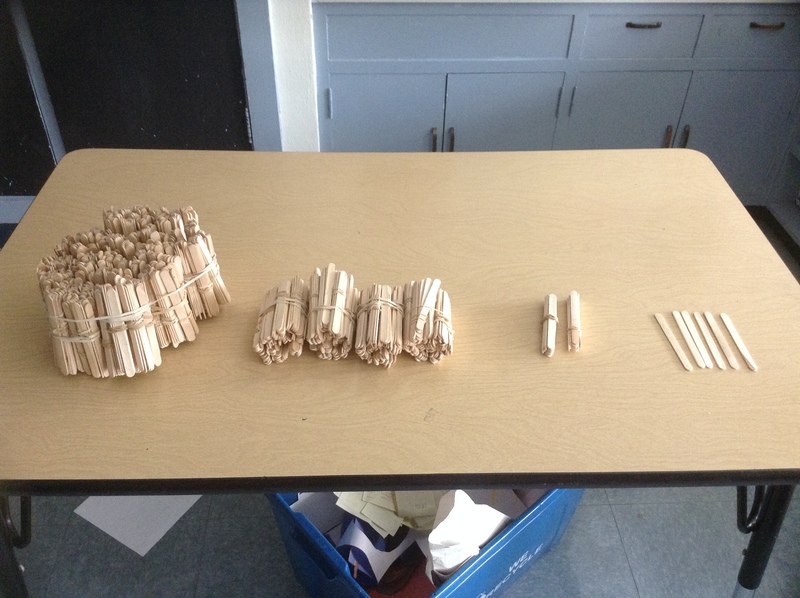 We counted the whole thing and agreed that we had one-thousand, four-hundred twenty-six sticks! Many minds were blown as we figured out how many 100s and 10s were inside that big number. We figured out that it was actually than just what the digit said, because of all of the groups inside of groups. I loved how many kiddos kept saying, “Wow, this is fun!” and “Man, we’re learning so much today!” Definitely lots of great mathematical thinking happening here! You had so many math posts on the blog this weekend, that I wanted to share a story with you. We have a Curious George story CD in the car that we listen to a LOT and in one of the stories George gets 10 dozen doughnuts. The other day when this story was on, Millie asked me if 10 dozen was 120! I was so surprised! I said that it was and asked her how she knew that. She told me “5 2’s are 10, and then another 5 2’s makes 20 and 10 10’s is 100 so, 120”. It took me more than a minute to follow the math just because it wasn’t how I was used to thinking of problems, but she was totally right and I saw this “new” math stuff in action :). It was kinda cool! She was doing multiplication and didn’t even know it. Thanks for teaching her such great foundational skills that allow her to do these kinds of problems in her head! Welcome to Rm. 202 (2013)! The following letter contains 2125 words that will begin to shape your fifth grade year. Be sure you have time to read them all carefully. You may like to have your parents sit and read with you so you can all be excited about fifth grade together.You should also have dancing shoes on (true story) and a video camera handy (extra credit). I am excited for the year ahead – but first, I need your help in knowing what next year is going to look like. What next year holds, is, in large part up to you. I have my plans, my ideas, my goals….what about you? I know some of you may have sneaked a peek at the letter I sent your parents, or may already know me, so this next part may be a bit of a review. Too bad. Keep reading anyway. 🙂 I have been teaching for 13 years and every one of them has been at Robinson! I even did my student-teaching there long ago, so Robinson is definitely my home-away-from-home. In my real home–which is in St. Peters–I have a fabulous family that I love dearly. My husband, Grant, is a teacher, too, in Wentzville. He has taught 4th and 5th grade like me, too. Fun, right? We have a 6YO, Riley, who will be at Robinson, too (he has Mrs. Appelbaum). I am sure you’ll get to know him really well as we got through the year together. We also have a little girl named Allison–we call her Allie–who is 2 1/2. We LOVE (yep, love) Disney World, and travel there often. We also just like to hang out together at home (or anywhere, really) and spend time with each other. So that’s me. What about you? Can’t wait to learn more about YOUR family! Like I said, I have been teaching for 13 years, and every year, I begin the school year as a different person. I decide on that first day and then every day thereafter, who I am as a teacher. What is important to me. What I want to accomplish. What I want my students to see when they come to school. I choose that. I don’t let other people tell me who I will be and I don’t just be who I think other people want me to be. I read, I think, I write and then I decide. Who Will You Be? (This is a big question – take your time to think about this!) Will you be the kid who has brilliant ideas? The kid who loves math? The kid who looks to help other people? The kid who……? Fresh start. Clean slate. We all get one (that includes you!) and we all get to begin fifth grade as the person we want to be. What is important to you? (This is another big question and one I am really curious about so I will ask it twice.) What is important to you? There are lots of things that are important to me: my husband and my kids, sharing ideas, reading, writing, being able to have a conversation, making things, discovering things, sharing what I know, sleeping in, staying up late and knowing when to say sorry. * Respect: If you’ve been around Robinson for longer than 5 minutes you know that respect is a HUGE part of our culture. It’s pretty much what we’re all about. I expect respect to be a huge thing in our classroom. I will respect you, and I expect you to respect me, as well as everyone else in our community. This counts when we agree and even when we don’t. I have a saying that I learned from my good friend Mrs. Ford years ago, that is really important with this whole respect thing. It’s this: You are not the sun. In other words, the world does not revolve around you, and there are lots of other people in our classroom that have needs, wants, likes, dislikes, etc., that we need to take into account. I love you, but I love everyone else, too! * Collaboration: I love to share ideas and get ideas and try new things and even when those things fail, I know I am just one step closer to finding what does work. I love to work with other teachers to figure things out and find new solutions to old problems. But just as much as working with adults, I love to collaborate with students. I love to hear what you’re thinking, how you’re feeling about things, what you think would be the best way to learn something. Even when you don’t agree with me, or have a plan that is completely different than mine, I want you to share it! It’s our classroom, and often your ideas are WAY better than mine. I know I’ll share lots of examples with you about how that’s happened to me over the years. * Questions: I found a quote I love by a guy named Tony who loves learning. “No one cares what you know. What the world cares about is what you do with what you know.” Think about that. Chew it over. We can all Google and find stuff out – but then what? After we know stuff, what we do with it = inquiry. And that is what the world cares about. Me too. You? * Technology : I love technology because it allows me to connect to new ideas. I like to think about what I want to do and look for tools to help me do it. I want to hear your ideas on technology and what works for you. We will be using technology in many new and exciting ways this year, so get ready! You’ll be blogging, using iPads and laptops (yep, you get your very own iPad Mini VERY SOON! ), working on the ActivBoard, making videos of your learning and trying out many new things that we may not even know about yet. Whatever we do, though, the goal is always learning. We will use technology in meaningful ways to better create new knowledge. Excited? I know I am! * Community: our class, our families, our school, our neighborhood, our city, our state, our country, our world. There are so many amazing people doing amazing things. I bet you can think of ten amazing people who do amazing things right now. We need to hear those people’s stories. Your mom and dad should be on that list. They are awesome. (Assignment one; email me List of Awesomeness about people in your family* -*family = people you love and are connected to even if they don’t happen to live in your house or share your last name). * Taking risks: I like to take risks. I hope you do too. It is scary sometimes and it fails sometimes but sometimes, more often, it is just A-MAZ-ING! Usually when you do something scary you do things you never thought you could. You surprise yourself. And then you want to do more! Someone smart once said “Fear and Excitement are shades of the same color”. Cool, huh? HANG IN THERE….THE END IS NEAR! So….what now? How can you best prepare for the extreme awesomeness of fifth grade? Think about what I said about being who you want to be. Most importantly, remember that everyone else in our class is thinking about that too. Be gracious to those who are brave enough to set lofty goals and make the effort to become an even better version of themselves. Look around your house (or your computer, maybe) for a picture of your family. I’d love to be able to decorate our room with us–pictures of all the people who help make us who we are and who encourage us to do our best. I want to be able to fill our window sills, bookshelves, walls–wherever there’s room–so please bring a 3×5 or 4×6 framed picture with you to Open House or on the first day of school. And if you don’t have one, don’t worry! We’ll take your picture! Here’s To Being Fifth Grade and Fearless! When you have had a chance to relax, digest this letter (maybe talk about it with your family or friends) and get your fifth grade brain tuned up, I would love for you to write to me to introduce yourself, ask questions, maybe respond to something you read in this letter that made you think. I look forward to hearing from you before the end of the summer!